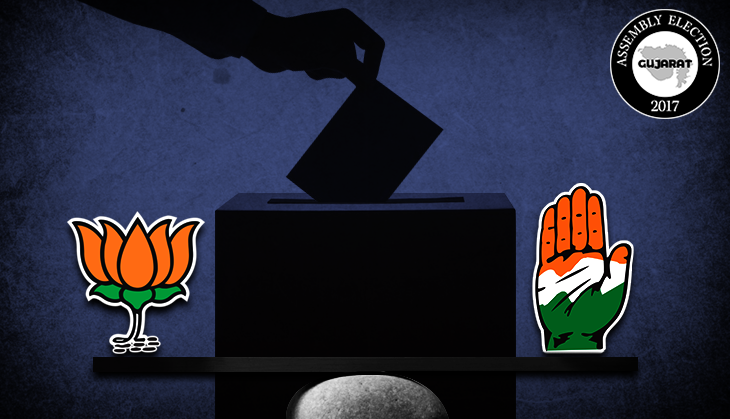 Gujarat has just wrapped up the first phase of its Assembly polls. The momentum is up and alive and the excitement shows no signs of waning. A steady flow of people – men, women, college students, party workers, with flags and bandanas – are making their way to the rally grounds, in tractors, autos, and buses. Prime Minister Narendra Modi is scheduled to arrive later on Saturday afternoon. “It is 50:50 here,” Dilip Patel, a BJP corporator says as we chat about the possibilities in the forthcoming second round of polling on 14 December. The Anand district, known best for dairy brand Amul, has been a Congress bastion except the Anand Assembly constituency which the BJP has not lost since 1995. “Out of seven seats, BJP won just two the last time. This time, too, we are confident of winning those two seats, Anand Assembly constituency and Khambhat,” Patel says. There is a close contest on five others, he points out in a matter of fact way. “This region is Congress’ fortress. It is the hometown of Madhav Singh Solanki. But we will breach it this time,” Patel, who comes from Karamsand a few kilometres away, says. Beside Madhav Singh Solanki, the place also happens to be Vallabhbhai Sardar Patel’s hometown. Albeit, another BJP worker overhearing the conversation is not confident about Khambhat. “There is a lot of resentment among the party workers,” he says. BJP has not given the ticket to its sitting MLA, Sanjay Patel. Rashmi Kant Patel, a long-time functionary of the BJP rues how the Congress has upset the caste arithmetic this time, as he sits in one corner of the rally ground. “For the past two decades, we worked hard to bring all the Hindu castes and communities together. But by supporting Hardik Patel, Alpesh Thakor and Jignesh Mewani, the Congress has tried to undo that hard work,” he says as he explains how he is keeping a tab on who all are coming for the rally. With the ‘all-access badge’ he is allowed to go anywhere. The fortunes of the political parties here depend on how the Kshatriyas, and the Patels, the two big communities vote. “I can tell you there are a lot of Kshatriyas in the rally,” he claimed. Because of Madhav Singh Solanki and later his son Bharat Solanki, the Kashtriyas have mostly voted the Congress as the local BJP leaders explain. “But the 2014 elections changed that,” Rashmi Kant Patel claims. 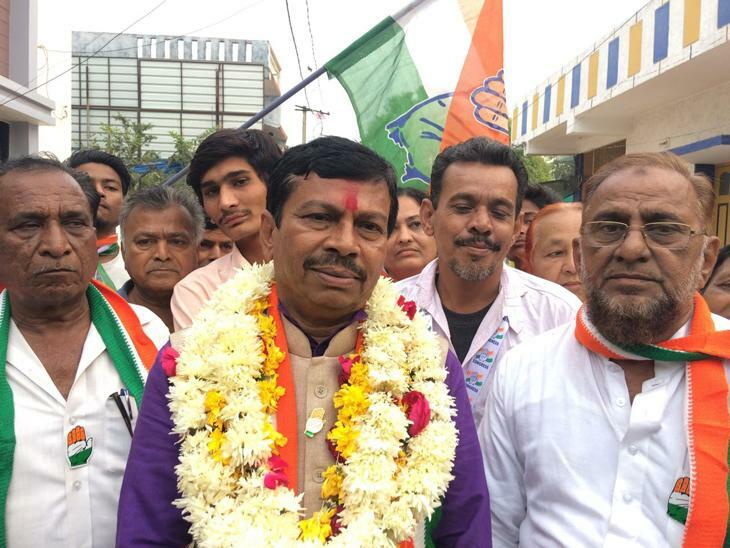 Dilipbhai Mani Bhai Patel won the 2014 Lok Sabha elections by more than 60,000 votes. “He has since worked hard on this vote bank trying to wean them away from the Congress,” Rashmi Kant Patel tried to explain as he called for a group of boys. 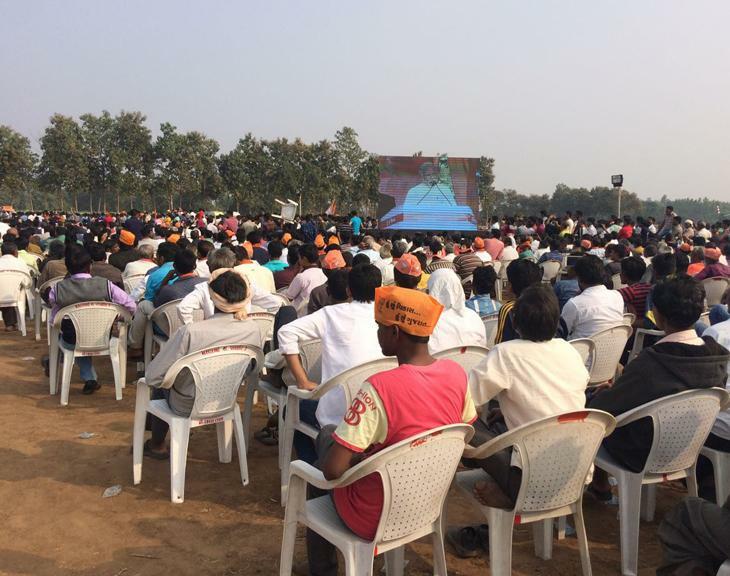 “We have come here for Modi,” they announced, as Patel explained their Kshatriya backgrounds. A few metres away, Nikul Patel, a young businessman, too, thinks, BJP is being over ambitious when it says it will win 150 seats. “It will not win so many this time,” he says over the loudspeaker blaring modern remixes of popular bhajans. And Congress’ rise has not got anything to do with the Patidar Anamat Andolan Samiti (PAAS)-led by Hardik Patel. “The Patidars here continue to be with the BJP,” Nikul Patel points out. Anand is often locally referred to as the NRI town with most Patidars having a family member with a thriving business in the West. Hardik Patel would find it difficult to rally even a thousand people here, the young businessman claimed. “Rahul Gandhi’s graph has gone up. He has learnt the art of talking to the voters,” Nikul Patel says, explaining why the Congress may do better in the state. But, a lot also depends on what Modi says in the rally, Nikul Patel says. On the stage a school kid read out a poem, which among other things, roughly said, “Hamare toothpaste me namak ho na ho, khoon me Modi and deshbhakti honi chahiye (Our toothpaste may or may not have salt, but we should have Modi and patriotism in our hearts)” and how “Kashmir mein aatankvadiyon ka safaya kar diya (Terrorists in Kashmir have been cleaned out)”. As the day rolls on, the rally ground is brimming with people. All the empty chairs have been occupied. “Modi can change what way the elections go,” Dilip Patel says. “Yahan pe Modi ka chehra chalega. Is there a bigger patriot than him?” he asks. As PM Modi’s entourage of helicopters flies in, the crowds rushed towards the makeshift helipad on the right corner of the grounds. The loudspeakers, meanwhile, now had changed from Bhajans to popular tunes of Bollywood music which interestingly included, Azeem o Shaan shahenshah and another old hit Bachna ae Haseeno. The thousands in the rally welcomed him with a chorus of “Modi Modi Modi” for several minutes. But there was pin drop silence once PM Narendra Modi took the stage. The silence only broke with bouts of laughter, as Modi, in his signature style lampooned the Congress over corruption. Most of it was what he has already said at many other places including how Rajiv Gandhi may have spoken about how only 15 paisa out of a rupee reach the villages but “but it is Modi who has cured that disease” and how because of going after the corrupt the Congress leaders are calling him names. “Gujaratis will not accept the way people are calling him names. Have you heard any Prime Minister being referred to in such bad language?” Rashmi Kant Patel asks. “In 2014, Congress lost Anand because Modi appealed that a Gujarati could become the PM if people were to elect BJP. Now that is not the case,” Hardik Vasava, a local young worker of the Youth Congress says. The situation has changed now. Despite poor and weak organisational structure of the Congress, Vasava points out how there are local youth organisations like the Kashtriya Sena who are organising the young voters against the BJP. “They have a big network. Alpesh Thakor is popular,” Vasava explained. Raju Bhai Tantri, another Congress worker in Anand, says the more than 10,000 traders suffered from GST, common man is suffering because of price rise. “BJP does not have any issue to stand on in this election. They are just doing politics of communalism,” Kantibhai Sodhaparmar, the Congress candidate from Anand says. While the BJP has retained the Anand Assembly seat since 1995, it is Kanti Bhai who has lost the elections on a Congress ticket since 2007. “Even if 4,000 of the 44,000 Patidars vote for the Congress because of PAAS, we will win. The winning margin in the last three elections has not been beyond 5000 votes, says Raju Bhai.